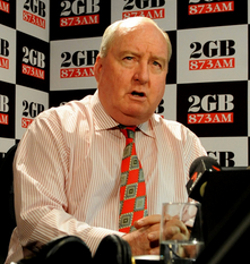 Radio broadcaster and failed former politician Alan Jones has issued a clear threat that he will continue to keep broadcasting if the general public don’t stop listening to him. This is the second threat Mr Jones has made in a week after threatening to attack any Liberal Party member who challenges sitting member for Hughes, Craig Kelly, for pre-selection. Mr Jones was contacted by The (un)Australian about his threat to keep on broadcasting, but he declined comment and instead spoke about the great mobile phone reception he receives from Optus. Prime Minister Malcolm Turnbull was unavailable for comment, however former Prime Minister Tony Abbott did talk of his plans to knight Alan Jones when he next becomes Prime Minister.